Simple settings: Just slide and press, you can complete all the settings. It can be optional from MON-FRI, MON-SAT, MON-SUN. Alarm will be automatically off at weekend, makes you enjoy your holiday, no to be late for school/work/party in business days. 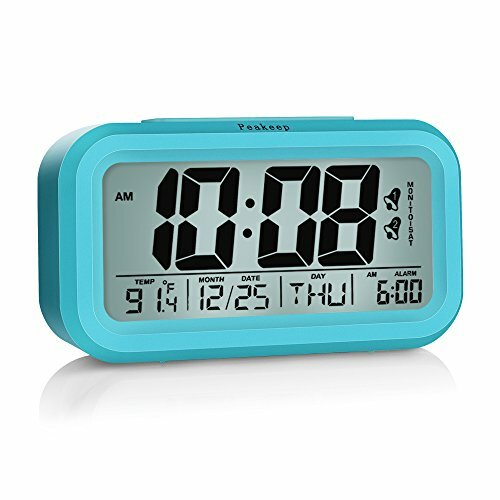 Large Display Digital Alarm Clock-- 5" unit, 4 3/4 " screen, nice large digital numbers display time(12 Hr/24 Hr), temperature(℉/℃), date, day of week, alarm time with clear and comfortable sense in an visual angle of 0-45 degrees. Day of week automatically match with correct date. Smart Sensor Light Clocks--Turn on the senor, sensor light enables clock to automatically give off soft blue light in dark. Energy-saving and user-friendly for a good sleep and better working environment.